Happy Wednesday! Last weekend was able to attend an event my sister-in-law put on to give grants to women and their spouses who are struggling with infertility. It was a lovely evening spent with family and friends for a great cause. I got a lot of questions about my look for the event so I thought I would share all of the details. I love pairing a fitted long sleeve black tee with a gorgeous detailed lace skirt for a dressy event. 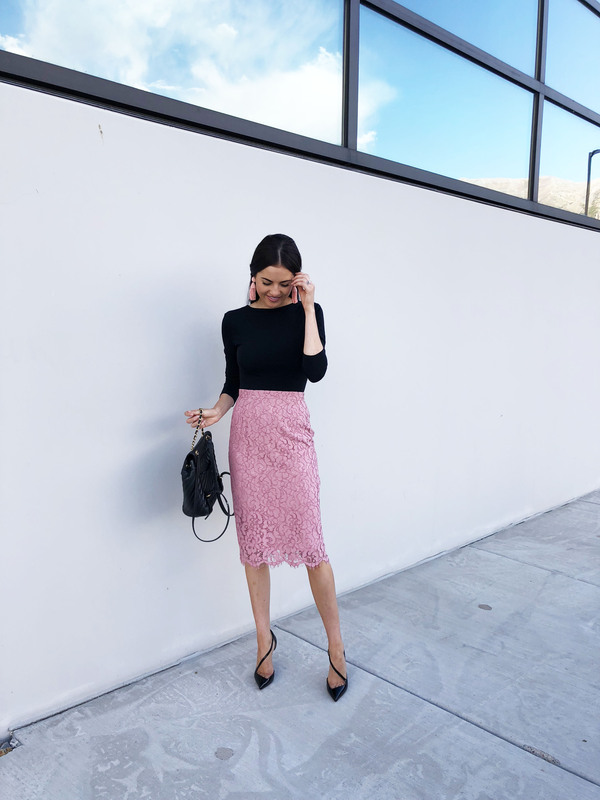 I wore the Autumn Lace Skirt from the Rachel Parcell Fall Collection with one of my favorite ribbed long sleeve tees for a sophisticated yet feminine look. One thing I love about wearing a lace skirt is how versatile they are. If you are wanting a more dressed up look you could pair this skirt with the Autumn Lace Top that complements the skirt perfectly. What is your go-to look for a dressy event? Tell me in the comments! The shoes are absolutely gorgeous! Thank you so much!! They are so classic and glam!! Lovely looks, lOve ♥️the simplicity and chic touch! ?♥️? Thank you so much!! It is so perfect for fall! What a wonderful event! Your skirt is gorgeous! It was such an amazing event!! Thank you so much! A Blue dress is my typical go to, but i love this skirt combo. The lace is so Pretty. I love the way the backpack adds sl ,uch glam without making the look too fancy. That sounds gorgeous!! I’m obsessed with that backpack. It is so glam! Great post! this outfit is so pretty, and i love the vintage vibes with it. The color of the skirt is so pretty and lovely! You look so gorgeous and classy ? This is such a lovely elegant look. Perfect for a special occasion. I’ve been an avid follower of your blog for years. I absolutely love your style and all the outfits you put together. you always look so professional and feminine. Fall is my favourite fashion season and I especially love checking out Pink Peonies for your fall outfits. I just started my blog this week and I would really love it if you checked it out. You’re my biggest inspiration? Thank you so much for your sweet comment! Congrats on starting your blog it looks amazing!! Thanks for following along!! Rachel I love the pink lace skirt . Great look for an evening event. HI Rachel! I’m a little behind on this and it’s a little off topic, but what is the name of your sister-in-laws foundation?? The topic is very near to my heart, I’d love to hear more about it!